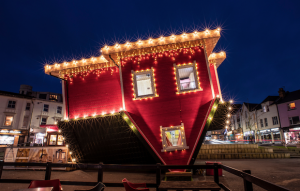 Come and see the Upside Down House at intu Lakeside. Upside Down House at intu Lakeside. THE extraordinary two-storey inverted home offers a zero-gravity style experience as it sits on its head in the amphitheatre just outside House of Fraser. The distinctive pink house has a unique, fully furnished interior with real life-sized furniture including two bedrooms, a lounge, kitchen, bathroom and office all upside down. Customers can walk on the ceiling, go up and downstairs, do handstands on the sofa without taking their feet off the floor and will never get bored as the furniture changes to match each season. Ben Leeson, marketing manager at intu Lakeside said: “We are very excited for the arrival of Upside Down House UK and know that our guests will be amazed by everything it has to offer.